← Help! Can you identify this insect? Yesterday I posted an identification challenge of a different sort. The main subject in the photo was a jewel beetle (family Buprestidae), but there was also another insect in the photo—a small parasitic wasp sitting on the branch below the beetle. Some of you saw it—Charley Eiseman was the first and correctly guessed it was a member of the family Encyrtidae, earning 5 pts, and Wikispecies editor gets 5 pts for further identifying it as a member of the genus Metaphycus. Honestly, I took several shots of the beetle and never saw the wasp until I examined the photograph during processing. I’m not certain, but I think the small object next to the wasp could be a scale insect (family Coccidae), which are known hosts of Metaphycus spp. Of course, there is still the jewel beetle, and it wouldn’t be fair for me to award points for the wasp but not the beetle. 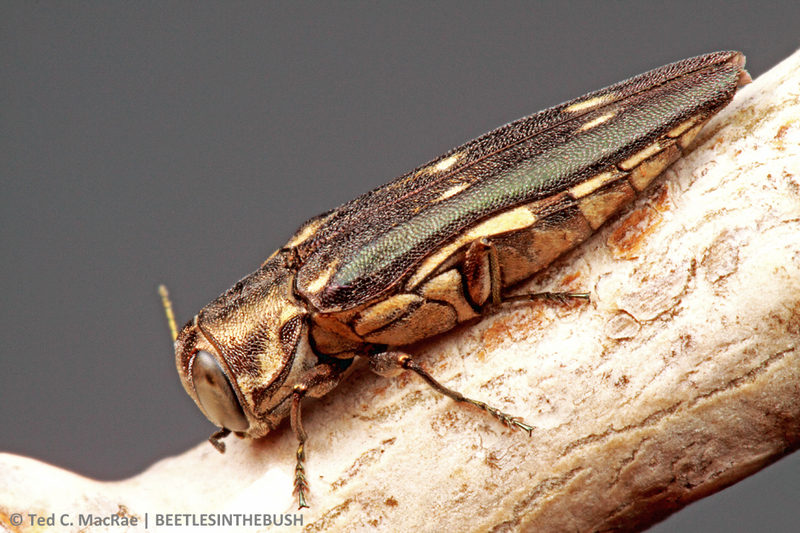 Heath gets 5 pts for first identifying the beetle in the genus Agrilus; however, nobody was able to identify the species as A. granulatus—commonly associated with cottonwood and poplar (Populus spp.) across North America. Since Charley was the only person to mention both the beetle and the wasp, I’m going to give him a tie-breaking bonus point and declare him the challenge winner. Populations of A. granulatus have been assigned to several subspecies—the beetle shown here (photographed June 2013 at Beaver Dunes, Oklahoma) represents the nominate form—restricted to the U.S. east of the Rocky Mountains, where it breeds in native eastern cottonwoods (P. deltoides) and introduced Lombardy poplars (P. nigra var. ‘Italica’). Agrilus granulatus is often confused in collections with A. quadriguttatus, but that species is associated with willow (Salix spp.) and can be further distinguished by the less dense pubescence of the lower face not obscuring the surface; the pronotum with the lateral margins evenly rounded and not strongly sinuate at the base, the median channel less distinct, and the lateral depressions scarcely pubescent; and the elytra more gradually narrowed posteriorly with the tips more acutely rounded and more coarsely serrulate and the pubescent spots less distinct (Fisher 1928). Fisher, W. S. 1928. 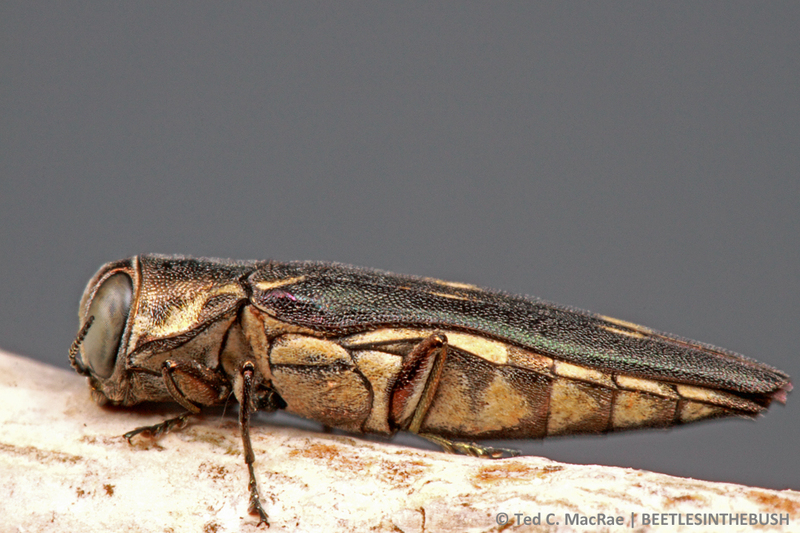 A revision of the North American species of buprestid beetles belonging to the genus Agrilus. U. S. National Museum 145, 347 pp. 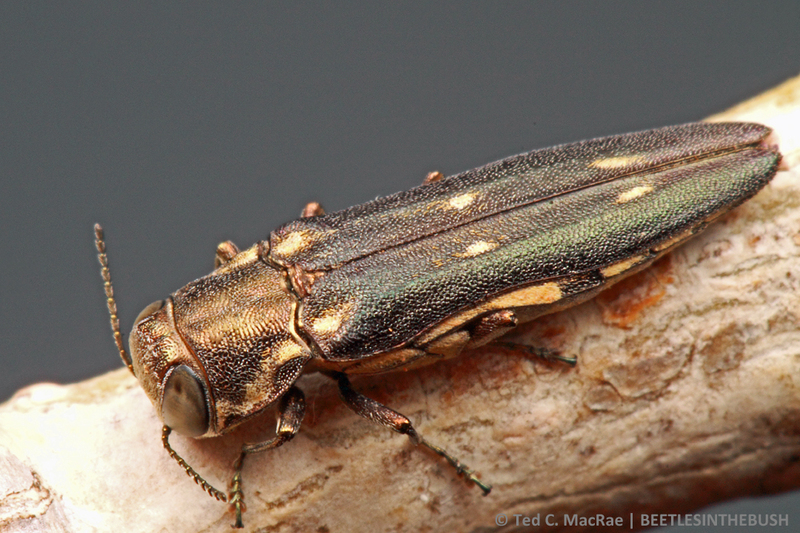 This entry was posted in Buprestidae, Coleoptera and tagged beetles, entomology, ID challenge, insects, jewel beetles, nature, Oklahoma, quiz, science, taxonomy. Bookmark the permalink.